Previewing the 2nd stop on Michigan's 2018 revenge tour. You're sick of hearing it. 1-6 against rivals. 3rd in the Big Ten East. No wins over ranked teams on the road. Mark Dantonio is 10-0 against the spread in this game. History does not care that seven of those years were the Rodriguez/Hoke era, or that 2015 ended via an act of God, or that last year's Michigan team performed quarterbacking malpractice. History cares about wins and losses. Jim Harbaugh is by no means on any hot seat (I shouldn't even have to bring this up), but I'm sure he's as tired of these narratives as you are. On paper this is a game that favors Michigan, a win pushes us closer to Michigan Ohio State Armageddon, and drops MSU from the Big Ten East contention. 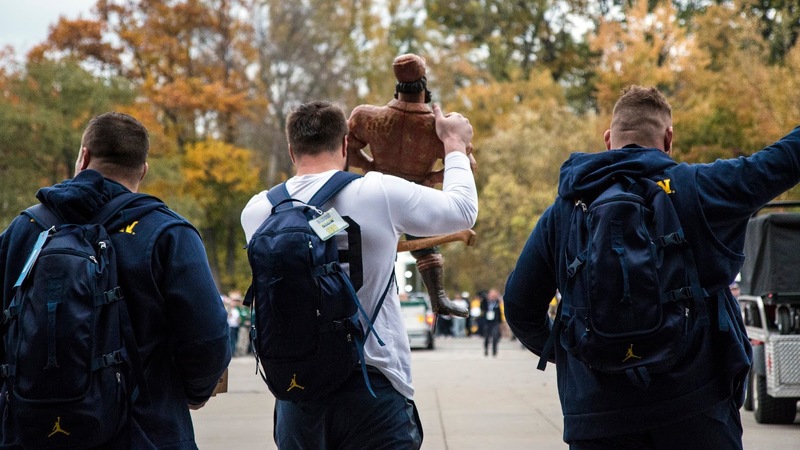 A loss and, well, we continue with the narrative that has plagued Michigan for 10 years now. This is not a game that plays on paper. Michigan State always comes out swinging in this one, even in games they had no right being in. 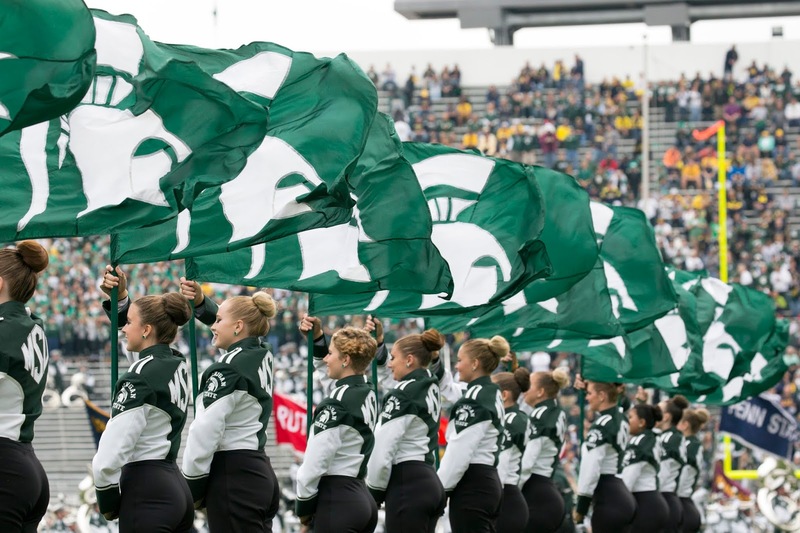 Maybe the Spartans used up all their inexplicable victory points of the season in last week's win against Penn State (every person I know who watched that has said the phrase "how did Penn State lose this?). But the playbook is now open for both teams. With all that said, this will be one of the most important games in Jim Harbaugh's Michigan career. Michigan State is pretty beat up, especially on offense. 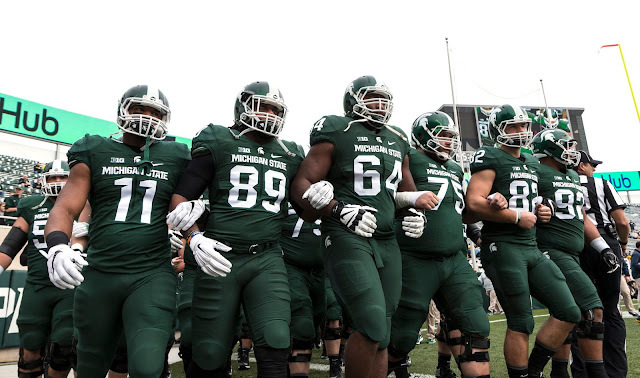 LJ Scott has shown no signs of returning, meaning he's probably returning for this game. MSU is averaging 3.4 yards per carry on offense led by, umm. Ermm. Would anyone like to volunteer to run directly at the wall of defensive linemen? Would-be starter LJ Scott (#3) is out with an injury, and hasn't seen the field since MSU's 16-13 loss to Arizona State. He has gone from week-to-week to questionable to not even traveling with the team at Penn State. No signs have pointed to LJ returning any time soon. MSU's most likely running back starter this weekend will be Connor Heyward. The sophomore's best game was against Central Michigan where he totaled 48 yards on a 3.2 avg. But really, look at the above list and take your pick. No Michigan State player has surpassed 100 yards rushing this season, and in fact besides LJ Scott, the best rushing performance was 79 yards on 3 carries by Jalen Nailor - a wide receiver (who is questionable in this game). The lead rushers against Arizona State went for 22, 20, 19, and 16 yards. It really doesn't matter who the running back is, the offensive line is some hot garbage. It doesn't get much better in pass protection, either. Through six games, MSU's QB has been sacked 15 times (2.5 per game). However, quarterback Brian Lewerke (#14) has been the bright spot on this offense. Since every game has been close, Lewerke has taken 225 of MSU's 228 snaps. One thing that jumps out here is that his rating has dropped in every game. This is most likely a direct result of both the competition getting stronger and wide receivers getting injured. Cody White would have been the go-to guy in this offense but he broke his wrist against CMU. Lewerke will rely on his top receiver, Felton Davis III, to make the big plays. Davis III was last seen in Happy Valley silencing 107,000 Penn State fans on his winning touchdown in a game that the Spartans didn't have much business being in, but somehow came away with a victory. If things made sense in this game, it would be hard to predict how the Spartans could realistically move the ball well. But the caveat to all of this is that MSU will throw their entire playbook at Michigan because this game is their Super Bowl. Remember the scripted kinda-scary opening drive the Spartans put together in 2016? It also wouldn't surprise me if some of the injured players make a return. MSU's run game is one of the worst on Michigan's schedule, and Michigan has a top 15 rush defense. 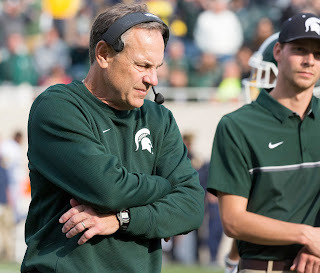 If MSU must rely on the pass though, they'll face Michigan's #2 ranked pass defense. Is there a more binomial defense in the country? Michigan State has the #1 ranked rush defense and the #110 ranked pass defense. The question that sticks out becomes, is their rush defense that good? Or is the pass defense so bad that teams don't need to run? Well for the most part, the run defense simply is that good. This trend was bonkers good up until the Penn State game, but 126 of these yards came on 78 and 48 yard runs. Take that away and Penn State had 79 yards on 30 carries (2.6 avg). Oof. This is a very good front seven. As a team, the Spartans had 8 TFL against Northwestern, 9 against Indiana, and 9 against Arizona State. Defensive end Kenny Willekes (#48) has 5 sacks on the year and 9 tackles for loss. Willekes will probably be a bigger challenge for Michigan's tackles and Northwestern's Gaziano. Nose tackle Raequan Williams (#99) is not a sack machine, nor is he fast, but he is strong and will eat up a lot of space. He is also second on the team in tackles for loss (5.5). Middle linebacker Joe Bachie (#35) is the heart of the defense and leads the team in total tackles with 43 (also has 3.5 TFLs, a sack, and an interception). 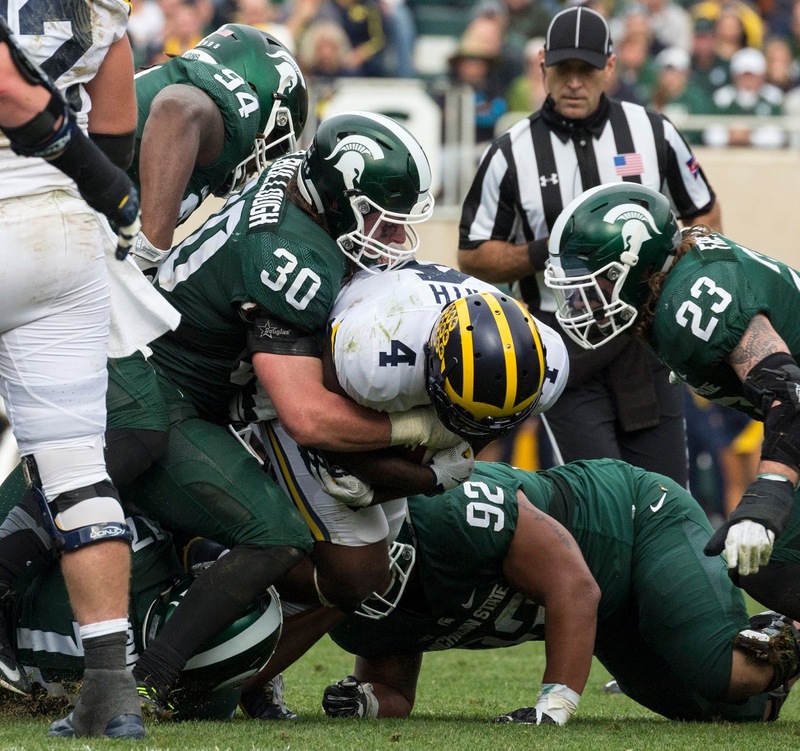 Karan Higdon might be the best running back Michigan State has seen all season, but running up the middle against this Spartan defense just isn't going to work for Michigan. They will need to air it out, because the Spartan secondary is the greatest weakness of the defense. The starting cornerbacks are injured and the safeties are okay (both have an interception and are #5 and #6 in total tackles on the team). Week one memories of Utah State gashing this defense with slants come to mind. This is absolutely a game that Shea Patterson should air it out 30-40 times. On the other hand though, I thought that about the Wisconsin game and it ended up being the run game going for 320 yards. Harbaugh has been throwing in weird wrinkles into his offense the last few games. The Joe Milton package last weekend against Wisconsin was probably put into place to give MSU something to think about. Michigan State can't run the ball at all and Lewerke is running for his life. Maybe they get some scripted drives in for some points, but they end up punting a lot. Michigan continues with their ground game success that they had against Wisconsin and throws some bombs to DPJ. It doesn't rain. 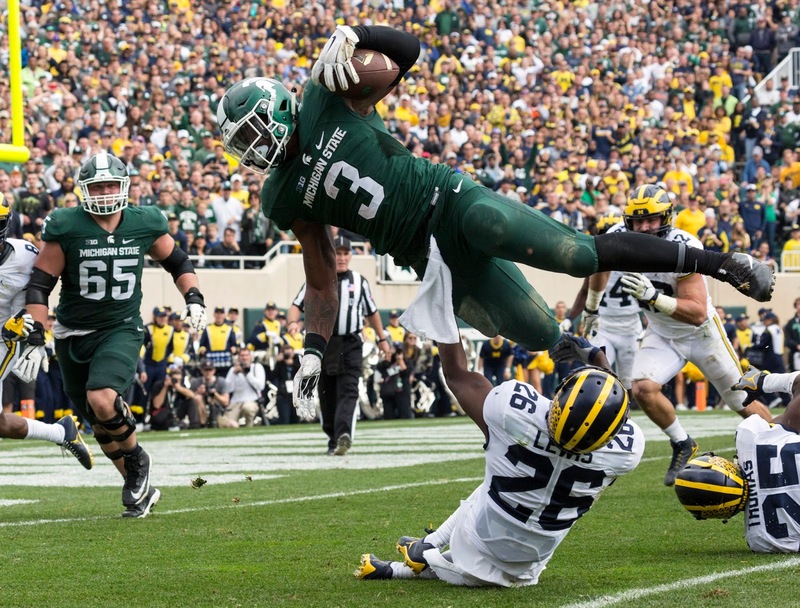 Michigan gets MSU vs Penn State game levels of bad luck and also get shut down by the MSU front seven. Lewerke and Felton Davis III connect and are able to get some points up. It rains.